It's almost a given that the White House is the most secure place in the nation — possibly in the world. So when a North Korean terrorist plot can be executed with frightening precision — circumventing the seemingly impenetrable defenses surrounding the U.S. president and everyone around him — it boggles the mind. That's the premise of "Olympus Has Fallen," the well-crafted political thriller from Antoine Fuqua, who has helmed actioners and thrillers such as "Replacement Killers," "Shooter" and "Training Day." This film's title comes from the fictional Secret Service code ("Olympus") for the White House, which is being led by a very President Kennedy-esque Benjamin Asher (Aaron Eckhart). But the true lead actor in this constantly gripping tale is Gerard Butler as Mike Banning, once the top presidential protecter for the Asher family, until a tragic event led him to be transferred to a pedestrian Secret Service job in the Treasury Department. Fuqua and his writing team of Creighton Rothenberger and Katrin Benedikt gave us a nice twist — a smart cinematic gift, really — as that forementioned "tragic event" (which I will not spoil by revealing) becomes a clever plot surprise. It's always good when something you KNOW is about to happen in a movie doesn't occur the way you think it will. Of course, the thrust of "Olympus Has Fallen" centers on the actual kidnapping of the president and his top advisers, including the vice president and the secretary of defense. 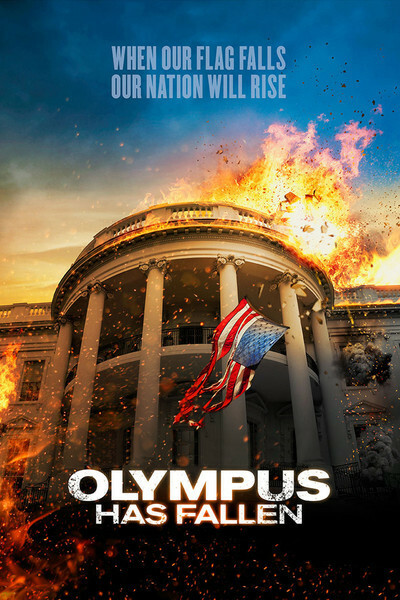 Though filmed over a year ago, "Olympus Has Fallen" benefits from recent international tensions, since the attack on the White House is masterminded by a group of North Korean terrorists. As the very convincing assault on the heart of Washington, D.C., and the White House itself occurs, Banning finds himself again thrust into the central action and quickly becomes the sole hope of saving the president and preventing a potential nuclear disaster that would end American life as we know it. While the storyline and dialogue are frequently predictable, "Olympus Has Fallen" succeeds largely due to Butler's believablity as a Secret Service agent. Banning has the physical skills and mental cunning that allows him to become a virtual one-man army against a phalanx of single-minded killers out to destroy America by cutting off its symbolic "head": the president himself. The special effects and attention to detail in "Olympus Has Fallen" are superb. It truly looks like the destruction depicted onscreen has actually occurred. Considering that most of this mayhem was created by CGI and filmed on extensive special sets constructed in Louisiana, the impact is even more impressive. Beyond the fast pacing and effective explosions and bombing sequences, Fuqua is aided by an excellent cast of veteran actors who lend a tone of gravitas and provide a solid foundation for the over-all story. Along with Eckhart and Butler — in one of his best performances in years — there's the always reliable Morgan Freeman, who takes a bit of a demotion from his previous roles as God and a U.S. president to portray the Speaker of the House. In addition, Angela Bassett is equally convincing as the head of the Secret Service, and Oscar winner Melissa Leo excels as the tough-as-nails secretary of defense, who endures very rough treatment by her North Korean captors. While the head terrorist role could easily have degenerated into a one-dimensional cartoonvillain, Rick Yune is terrific as the chillingly charming — yet completely lethal — Yang, the mastermind of the entire plot. While "Olympus Has Fallen" breaks no major new ground in the political thriller genre, Fuqua has directed a sharp, very taut adventure that keeps you engrossed from start to finish. It delivers some excellent visuals and a few surprising twists that add beautifully to the suspense.